*only official because I say so. Question authority. Quantum Vibe is in it's own distinct universe, but there are many in-jokes and acts of homage to other fictional characters. Short of starting a Vibe-verse wiki, I thought it would be a good idea to collect them all in one thread. 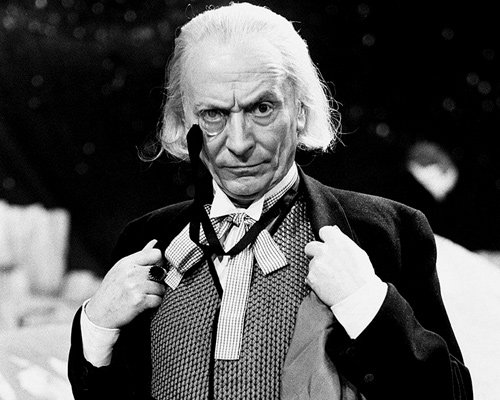 #1 Homage to the first Doctor (Doctor Who). Compare page 945 #4 and this image I found by searching ddg.gg for "first doctor who"
page=81 panel 5 "lord of all space and time"
page=16 is the first reveal of Seamus (Mk. I) , and he looks quite a bit like the 4th Doctor sans scarf. Plus, as noted at the time, it appears there is a TARDIS attached to Seamus's residence. Good one, Bob! totally missed that one. I'm going to have to dig up more non-whovian homages to keep from making this thread so one-sided. page=946 Benedito Fernandes looks an awful lot like the 2nd Doctor. page=848 Carl Hendry, a neo-Rooster, says a catchphrase associated with the Foghorn J. Leghorn. Was just thinking tonight that many of the 'plastic surgeries' or general ageing has Seamus going through the 'looks' of the various Doctors. And yes, the very earliest bits of QV (V1 pigs 16/17) had him looking like a 'beefy' Doctor #4 / Tom Baker. The Trial History -- pg 945 is a VERY Doctor #1. And 946 & 950 (after surgery) you can see strong likenesses with Doctor #2. And of course, today's page, 954, has another surgery and looking more like Doctor #3. The TARDIS is upside down and attached to the 'reception room' funnel into which Nicole is traveling in the lower right quadrant of the fourth panel in strip 15. 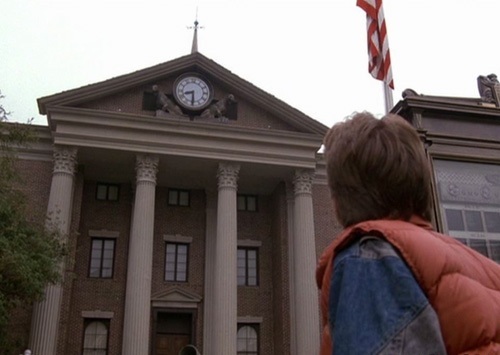 Is that a copy of the courthouse in Back To The Future on the left side? Next version; all teeth and curls. Wasn't it Doctor 2 who actually knitted the scarf? Popeye the Sailor makes an appearance on page 959. Actually that's Poop Deck Pappy. Yep, the difference between Popeye and his "dear old dad" was that Poop Deck had a short white beard. This individual had the beard.